I love, love, love learning about historical time periods…preferably the ones in which romance novels are set! I adore Regency novels as well as other eras, but one of my favorites? The Victorian age. When I took a Victorian Lit class in college, I was in heaven, as you can imagine. So, I guess it wasn’t too much of a jump that my first historical romance series ended up in that time period. From a young age, I loved dressing up in my mom’s old dresses, and just about swimming in them while I put on her lipstick and high heels. As soon as I was old enough to watch historical films, I was mesmerized by the elaborate yet beautiful gowns the women wore. I wanted to be just like them! In 2002, while I was still in college, I began writing book one of the Heiresses in Love Series. It was a trilogy very close to my heart, and I related in many ways to each of the female characters. It was so much fun to live vicariously through my characters as they tried on gowns, dressing for certain occasions. Several years later, when I was searching for a wedding gown and trying on different styles, I knew just what that felt like and it wasn’t too hard to use my experiences to fill in those details. While I researched each book in the series, I found so many gowns to use as inspiration. Today I’d like to give you my top five choices from the books. Each one has a special significance, and with every design, I will include a small teaser from the boxed set of the trilogy. He laughed as she ran to search her wardrobe, calling for her nursemaid in a mock panic. That evening, they arrived for the first time together at a social event. The opera house was decked out in gold and alabaster pillars. The floors were covered with red velvet carpeting and the theater itself was elaborate with scrolled ironwork. But, Grant could not keep his eyes off of Fara. She wore a long velvet gown, plum-colored with ivory trim. The torso of the gown fit close to her body and the material covering her bosom was heart shaped. Her hair was done up, but the locks fell close to her ears and gave a splendid view of her neck. And what was more, he felt as if they arrived as an affianced couple, even though he knew it was otherwise. It felt so right to be with her. “Of course.” Grant's manservant left the cabin to see to this need. She nodded. Her spirits lifted from his learned assurance, she let him lead her upstairs. Over the meal, the crew tried to keep her spirits up with yarns of their many adventures. Her mind, however, kept drifting to her so-called fiancé. Monsieur Bordeaux must be confronted, she thought. What he had done to Grant was inexcusable. She had been aboard La Voyageur for little over a week and no one had mentioned anything about the man who'd challenged their captain. It was time to do something about this. Later, after breakfast, Mrs. Hill led Chloe to a large bedroom. The room was decorated in dark red colors. The damask wallpaper was rather lovely, and the spread on the bed looked very soft. Even the vanity was tailored to go with the room. The room was quite charming really and very romantic, but she didn’t want to wonder of the relations between Gabriel’s father and mother. “Come along then. It’s in the trunk.” Mrs. Hill reached a large steamer trunk complete with lovely accents. She lowered herself to her knees before it and then threw the lid back. “I’ll return your other dresses to you,” Chloe said to cover the silence. “Keep them. I have too many. My husband Grant…” She shook her head with a smile. “When he is here, he likes to spoil me. He takes Adrienne and me out to the modiste and lets us buy anything we want.” She sighed. “This, though, is very special.” Fara Hill reached into the trunk and unearthed yards of soft, blue velvet. She fingered the fabric for a moment and Chloe thought she detected a sheen of tears in the woman’s violet eyes. The moment seemed to pass, however, and she rose to her feet once more. Hours later, Chloe was dressed in the dark blue costume. The velvet was soft like mink against her skin. She looked in the mirror in her bedroom and could not tear her gaze away. The sleeves were narrow and the neckline was cut low to tease onlookers with the tops of her breasts. The only thing that made it acceptable was the extra white lace fabric adorning the neckline. The rest of the gown flowed out beautifully and was adorned with nothing but the rich blue fabric. Gabriel’s mother had also lent her a necklace with a pretty substantial sapphire pendant in the shape of a heart. The whole costume was perfect, far from what she was accustomed to. Even when she’d lived with her father, she had hardly ever attended balls. There simply wasn’t the occasion for one. Her neighbors were content to go to the theater or to hold simple afternoon teas. Parties were very rare. In truth, she imagined her father had been too busy to take her to any. With a shrug, Chloe pushed her feet into some matching blue slippers. She checked the mirror again. A maid had drawn her hair up into a bun, then several long curls hung here and there down her neckline as well as around her face. Adrienne found that reason had abandoned her once more by the next evening. Draped in her dressing sacque, she paced along the soft blue carpet of her bedroom. She glanced at the cherry wood Tiffany Durfee grandfather clock, noting it was exactly one hour before the men were to arrive. Adrienne chewed on a thumbnail. “I know not what to wear to this event,” she complained. She nodded. The peach silk gown would suffice. Many of her contemporaries bemoaned the fact that she could wear the color while they couldn’t. But, it wasn’t her fault she’d been born with a light gold tint to her skin. She allowed Selene to outfit her in a shift, a corset and pantaloons. Next came her gown and she watched as the woman managed the chaos of her hair into some semblance of normalcy. Soon, it was pulled up into a half updo while the rest tumbled down her back in waves. Pearls were added at her ears and around her neck as a complement to the color of the gown. The cream-colored silk slippers she adorned pinched her feet a little, but she imagined they were a necessary evil. When she saw her image in the mirror, she recoiled. It was always like this. Adrienne never thought about how she looked usually. In truth, judging by her mother’s frequent disapproval, she knew she didn’t understand fashion or care about propriety all that much. But, when Selene had the occasion to cater to her appearance like tonight’s event, she thought the stranger in the mirror wasn’t really her and she worried it was a façade she couldn’t maintain. It wasn’t that she thought herself ugly, not at all. Her parents had given her enough compliments over the years to believe otherwise. But, parents were biased. She knew she was passable at best. Yet, she was surprised when men paid attention to her. Logic told her that a male would follow anything with breasts so that must be the reason. No, her anxiety this eve was something else entirely. It grated on her nerves as she realized she sought his approval. She shouldn’t even care what he thought, but the urge to challenge his cool composure came like the quick thud of her heart. Natural and yet impossible to ignore. But she must if she meant to retain her sanity at all. This was just business, she reminded herself. It was hardly personal. That seemed to help, at least until a maid came to the door, claiming the gentlemen had arrived. She couldn’t dismiss her racing heartbeat and in an attempt to calm herself, she let out a long breath and allowed Selene to drape a silk shawl over her shoulders, then left the room. Down the hallway, she stopped by Elena’s room, but once more her boudoir was empty. She frowned, and descended the stairs only to freeze in mid-step as she saw Monsieur du Plessis, who waited at the bottom. He was dressed in a black evening suit complete with trousers, a jacket, burgundy vest with matching ascot and a white dress shirt. He also wore an overcoat, and stood with his arms crossed behind his back. His dark eyes were still unnerving and she couldn’t help the heat which moved into her cheeks at his intense regard. “Goodness, is it that time already?” she jested, forcing herself to move forward. “Thank you,” she breathed as his hold shifted to her hand and he lifted it to his lips. The pressure of his mouth on her skin caused a tingle, and an answering burn somewhere inside her body. How silly that she must be moved by a simple kiss, she thought. True to her word, Adrienne didn’t have much to be concerned about. By eight o’clock, she was dressed in a deep pink, silk gown with floral embroidery lining the fabric and a heart-shaped neckline which dipped over the tops of her breasts. The gown was an older style, to be sure, because most of the fashions these days were modest. She also carted a sheer wrap which matched the color of the gown. Instead of making her look pale, the shade was a complement to her golden skin tone. She wore a set of pearl jewelry, dangling at her ears, neck and wrist. She couldn’t look away from the mirror. Adrienne was not a vain girl at all, but her maid had managed to make her look glamorous. “Thank you,” she breathed, and strangely felt like a princess in one of Elena’s fairy tales she so loved. Well, I hope I’ve given you a glimpse into this Victorian romance boxed set, at least by showing some of the gowns I loved from the trilogy. You can learn more about the series below. Have a great week! Open To: USA ONLY. 18 and Older. Or, you can check out each book in the trilogy! Fara Bellamont has been back in society for a year after leaving Cluny Abbey, where her uncle sent her long ago. When he chooses a suitor for her for marriage, she fears that she will be forced to marry a stranger and live a miserable life. But, Fara finds herself thrust into an adventure of a lifetime when unforeseen circumstances cause her to place her trust in a strange man for protection. His intervention not only saves her, but puts her in an even more compromising position. 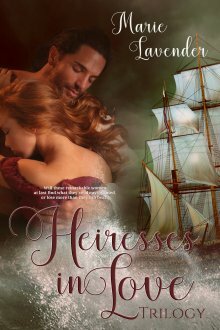 Grant Hill, a trading captain, is enchanted by the young heiress not only because of her beauty, but because she is hardly conventional. Underneath her ladylike exterior lies a tigress. Grant cannot help but offer his protection as she is in need and he is far from immune from her charms. Multi-genre author of Victorian romance, UPON YOUR RETURN, and 22 other books. UPON YOUR LOVE and THE MISSING PIECE placed in the TOP 10 on the 2017 P&E Readers' Poll. DIRECTIONS OF THE HEART was nominated for the 2017 Reader's Choice Awards. The I Love Romance Blog became a finalist in StartDating DK's Romance Blog Awards of 2017. ILRB landed on Feedspot’s 2017 TOP 100 Novel Blogs and TOP 100 Romance Blogs. DIRECTIONS OF THE HEART placed in the TOP 10 Books of 2017 on Amy’s Bookshelf Reviews blog. TOP 20 Authors of 2017 on Amy’s Bookshelf Reviews blog. Mystery Blogger Award for 2017. A to Z Blog Challenge Survivor in 2016. March 2016 Empress of the Universe title - winner of the "Broken Heart" themed contest and the "I Love You" themed contest on Poetry Universe. SECOND CHANCE HEART and A LITTLE MAGICK placed in the TOP 10 on the 2015 P&E Readers' Poll. Nominated in the TRR Readers' Choice Awards for Winter 2015. Poetry winner of the 2015 PnPAuthors Contest. The Versatile Blogger Award for 2015. Honorable Mention in the 2014 BTS Red Carpet Book Awards. Finalist and Runner-up in the 2014 MARSocial's Author of the Year Competition. Honorable mention in the January 2014 Reader's Choice Award. Liebster Blogger Award for 2013, 2014 and 2016. 2013 and 2014 Amazon Bestseller Ranking for UPON YOUR RETURN. Top 10 Authors on AuthorsDB.com. Winner of the Great One Liners Contest on the Directory of Published Authors.